"Time is so incredibly precious....always make your story incredible". Those are beautiful words from Helen Alexander that really are a mantra to live by, aren't they? It seems like sometimes we get so caught up in the day-to-day grind that we stop concentrating on the things that really count. 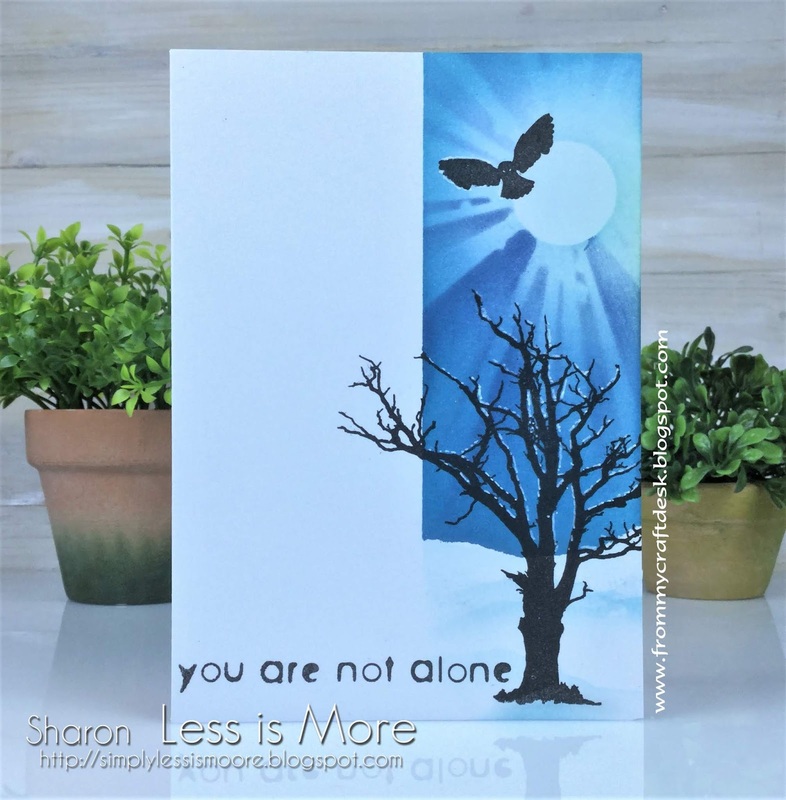 I know I'm very guilty of that, so I made this card to remind me to just look up occasionally, take a deep breath and evaluate if I am making my story incredible. You should try it too - it is very refreshing! That's what I love about the amazing products from Visible Image, you can always find a wonderful sentiment with a deep meaning and a glorious image to go with that sentiment. Honestly, Helen and Mark Alexander are two of the most talented people I know. Long may they carry on delighting us and producing incredible products like these. Right on to the details of my card. I had loads of fun making it. I got messy with some table salt - it's a technique that I've been meaning to try for years and I love the results so it won't be the last time I use this technique. Here's how I made the card. Mask off a section on a panel of water colour paper. 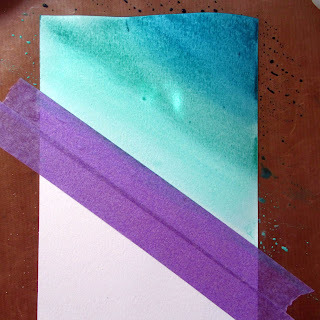 Wet the section you want to have colour on, then using 3 or 4 shades of water colour, paint the wet section, slightly blending the edges between shades. 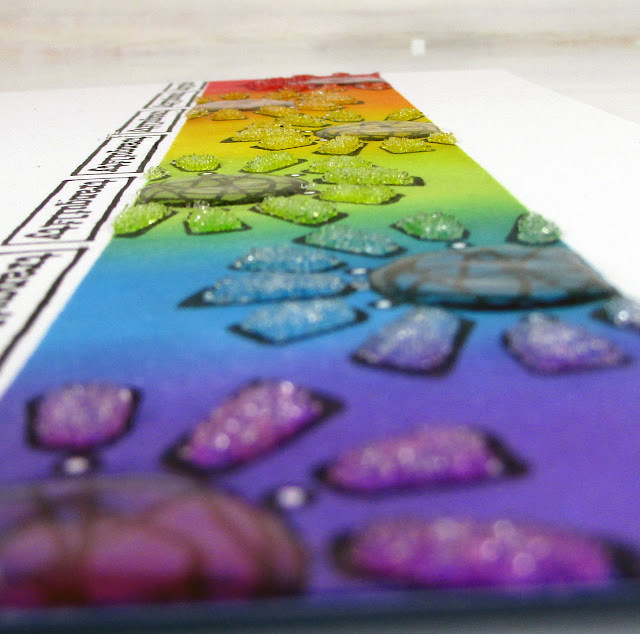 Sprinkle some table salt onto the watercoloured part and let the panel dry completely before rubbing the salt off with a cloth or your fingers. Once the panel is dried and all the salt removed heat emboss the How Fragile stamp in white embossing powder. 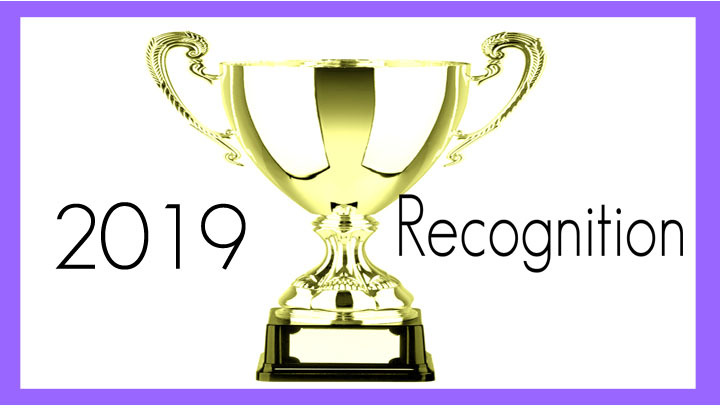 You can add parts of the stamp to the areas that are not covered by the first impression, just make sure that the image will be over the top of any parts that overlap. 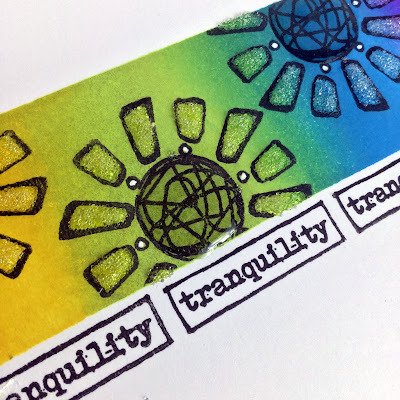 Make a nice crisp edge to the coloured area by inking Versamark ink between two pieces of masking tape that has a small gap between them straddling the edge of the coloured part, then heat emboss it with gold embossing powder. Attach the panel onto gold card for a thin border before attaching both to a coloured card blank. Now heat emboss the shattered watch twice onto a holographic gold card with white embossing powder. Cut one of the images up and layer it on top of the other image using 2 different depths of foam. 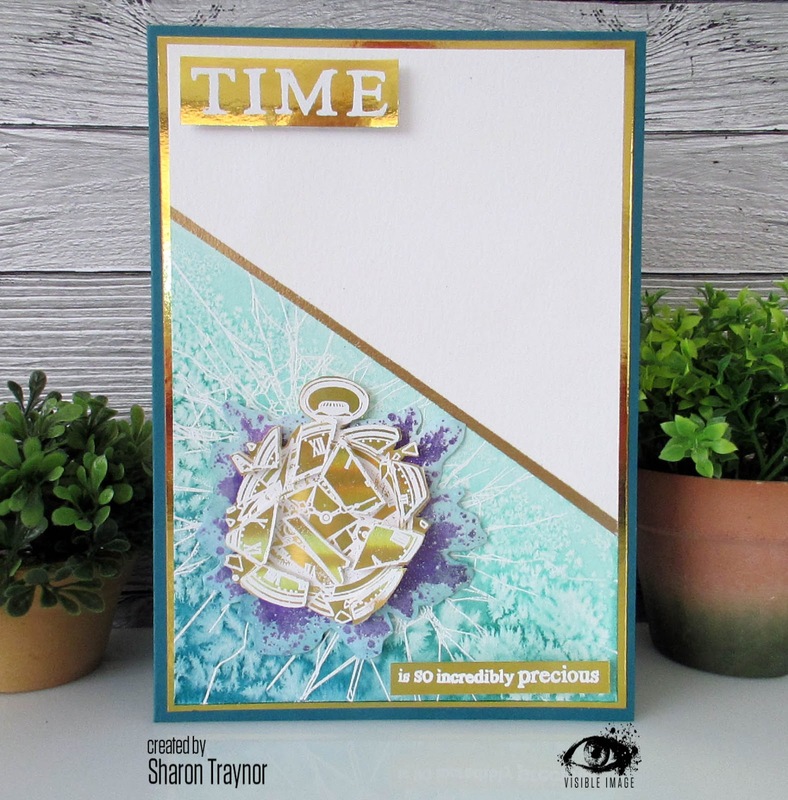 Stamp the background for the watch onto spare card in purple ink and heat emboss with clear sparkle embossing glitter over the top. Fussy cut the background and water colour the edges to match in with the main panel. Curl the edges slightly then attach this to the card with foam, adding the completed watch on top with more foam. 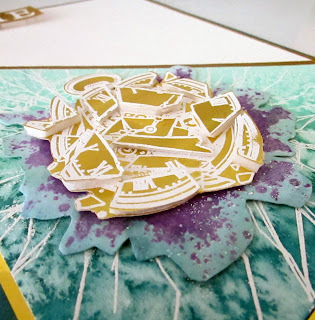 Stamp, heat emboss and cut out the sentiments adding those with foam to the front of the card. 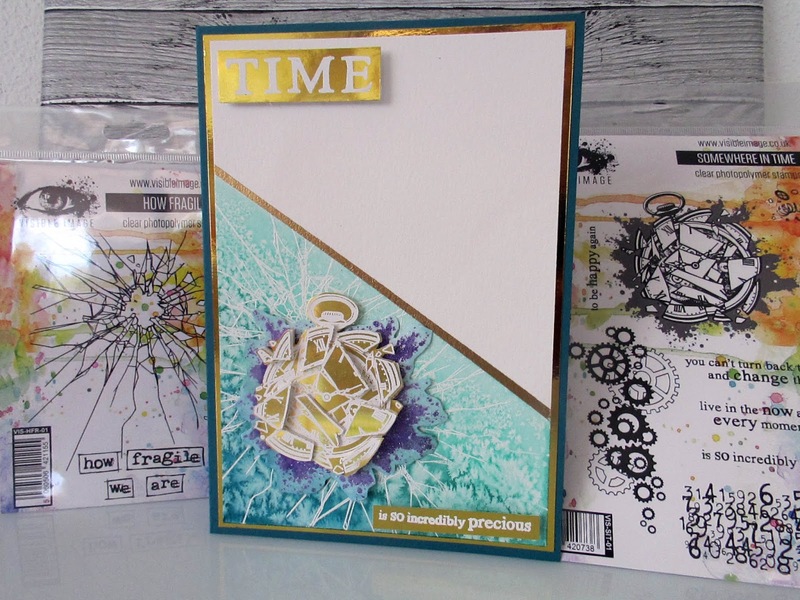 For the inside, take a piece of paper and stamp the cogs over the bottom right corner with a gold ink. 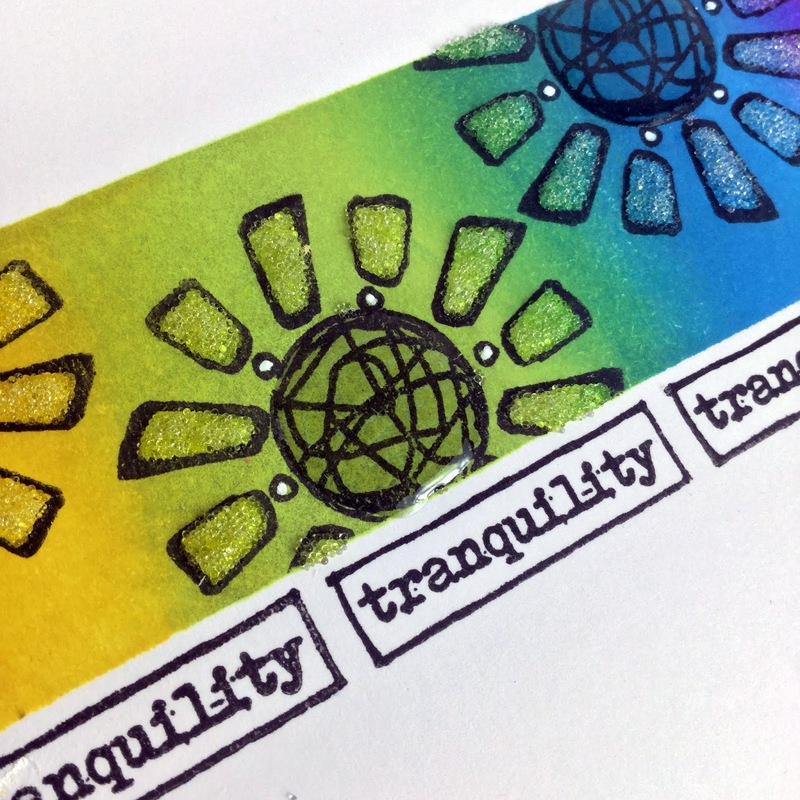 The sentiment inside is made up from masking and inking just the 'Always' from 'Always Listen to the voices in your head', then stamping two other stamps from the same stamp set underneath it. Water colour card, masking tape, Gansai Tambi Watercolours (50 pale aqua, 56 marine green, 57 turquoise green), water & paintbrush, table salt, coloured card blank, gold holographic card, Versamark clear ink, Wow! embossing powders and glitter (opaque bright white, metallic gold rich, clear sparkle), heat gun, scrap of white card, Prism ink (purple velvet), scissors, 3d foam, White paper, Encore ultimate metallic gold ink. That's it from me for now. Thanks for stopping by and I really hope to see you again soon. Labels: Gansai Tambi Watercolours, Visible Image, Visible Image Stamps, Wow! Hello! 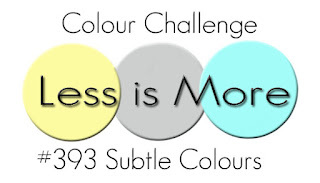 I'm back to introduce the first challenge of April at Less is More and we have a lovely spring challenge for you all about subtle colours. Personally, I really struggle being subtle because I have a great love of vibrant colours. However I did manage to come up with three creations for you today - two using AlteNew stamp sets and one using magazine freebies. The colours on this card are incredibly subtle in real life but the black frame makes them look a little more vibrant. 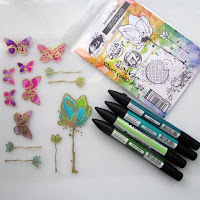 Cut a panel of water colour paper and stamp the outline of the flowers in black ink and water colour them with zig pens. Cut another panel the same size then, using a craft knife and ruler, cut out the central section to leave a thin frame. Ink the frame with clear ink and heat emboss with black powder. OTHER: ZIG clean colour real brushes (english lavender, green shadow, shadow mauve) WOW! 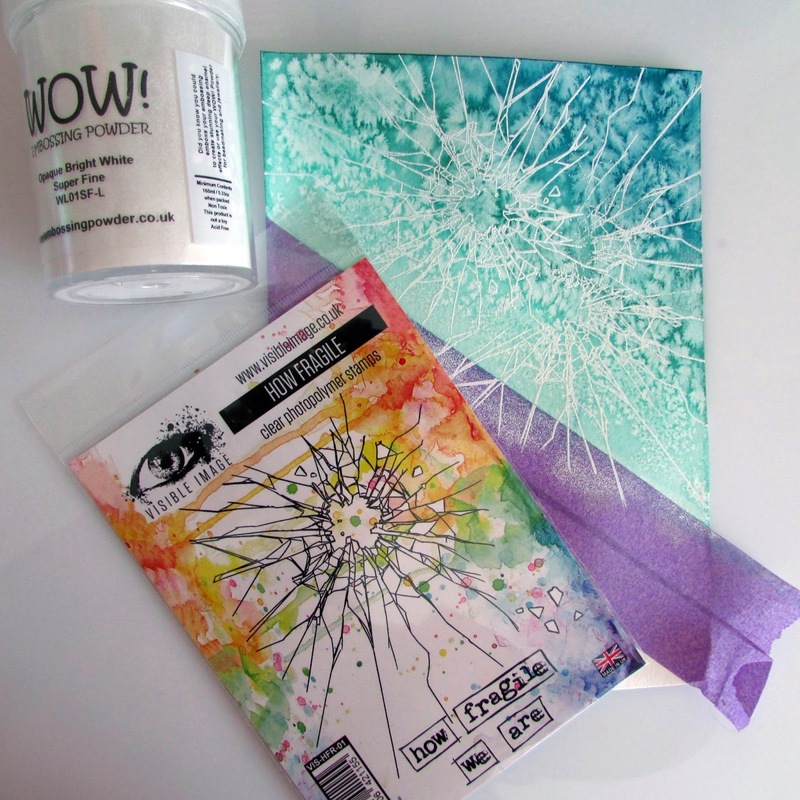 primary ebony embossing powder, stardust Stickles, ruler, craft knife, water colour paper, white card, fun foam, glue. 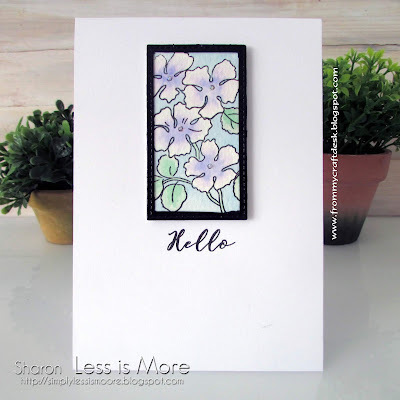 I didn't lead with this one on the Less is More site because it has the least amount of 'white space' but it does have the subtlest colouring because the flower was inked in one shade (except for the very final layer). 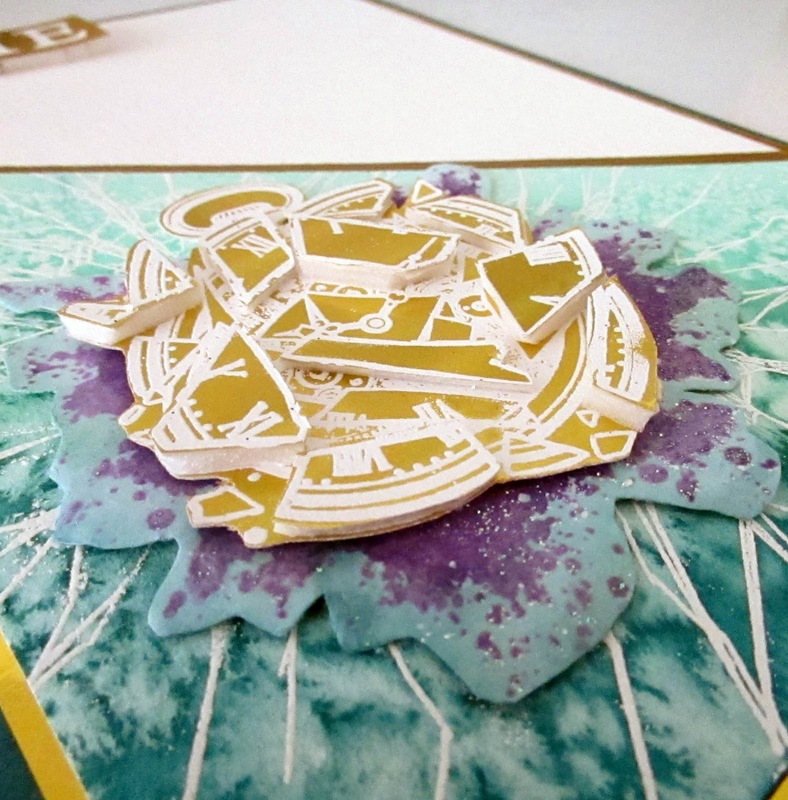 Attach the outline of the flower to a stamping platform. Ink it up and stamp onto the panel, rotate the panel 108 degrees then ink and stamp the image again. Repeat this rotation and stamping process for each layer. Use a blending foam on a blending tool to apply the ink on each layer - this helps to give a subtle shading. 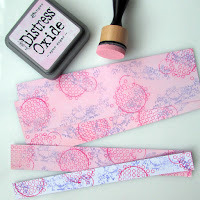 on the darkest layer add a tiny bit of lilac onto the stamp. Mask each flower then stamp the lilac flowers around the main bloom. Define the edge of the panel with a swipe of the lilac ink. Layer the panel onto pink paper and then on a card blank. 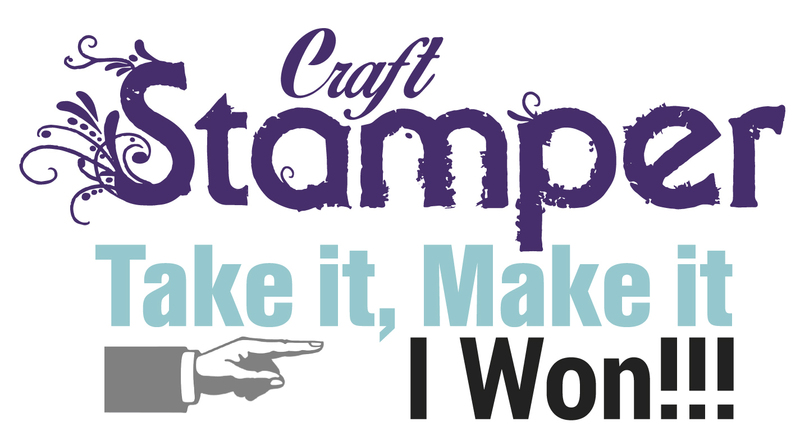 Stamp, cut out and add the sentiment. 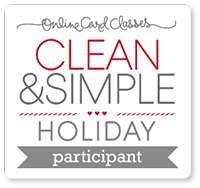 This card was made in well under 10 minutes! Well, except for the drying time on the nuvo drops. I wasn't happy with all the shades on my other two cards so I practically threw this one together. I used some freebies that came with issue 186 of Simply Cards And Papercraft. The flower stencil is a Dylusions one and it was inked through with spun sugar distress ink. The stamp is a ranger Letter It stamp and it was stamped in wisteria ink and fussy cut then mounted onto foam. To finish, 3 of the corners were rounded and white nuvo drops were added to the flower centres. That's it from me for now. I hope you found something you like and I really hope to see you again soon. As I write this post I am listening to the wind howling away. We've had some very windy and rainy days in the Algarve during the past week......but that weather is incredibly welcome because there have been worries of a drought coming this summer. So I say "bring on the rain and fill our bore hole up!". The only down side is that gloomy weather makes it hard to take good photographs, so I snapped a couple of shots when the sun peeked out for a few minutes. Okay, to today's card. 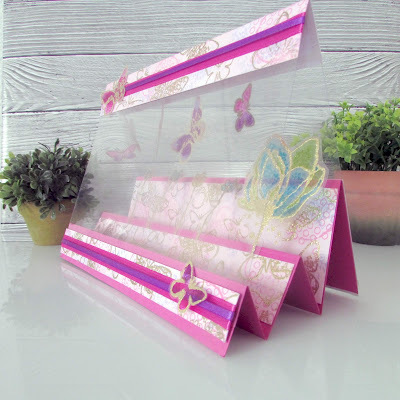 This is such a fun shape of card and it is one that I make very often for friends because they always seem to love a bit of acetate on a card. It is simply a stepper card with an acetate 'tent' on top of it. Today, for the first time, it contains some suspended elements! Those fab butterflies from the Visible Image Wings of Change set were just crying out to be flying around. The techniques I used on this card are some heat embossing and acetate colouring with alcohol pens. Whilst tidying my craft room I found this heat embossable acetate. 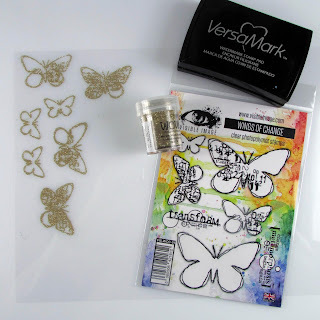 So it was perfect for embossing the butterflies and the flowers in a glittery embossing powder. 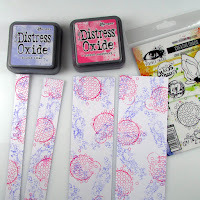 I was surprised that it took very little heat to do the embossing too! 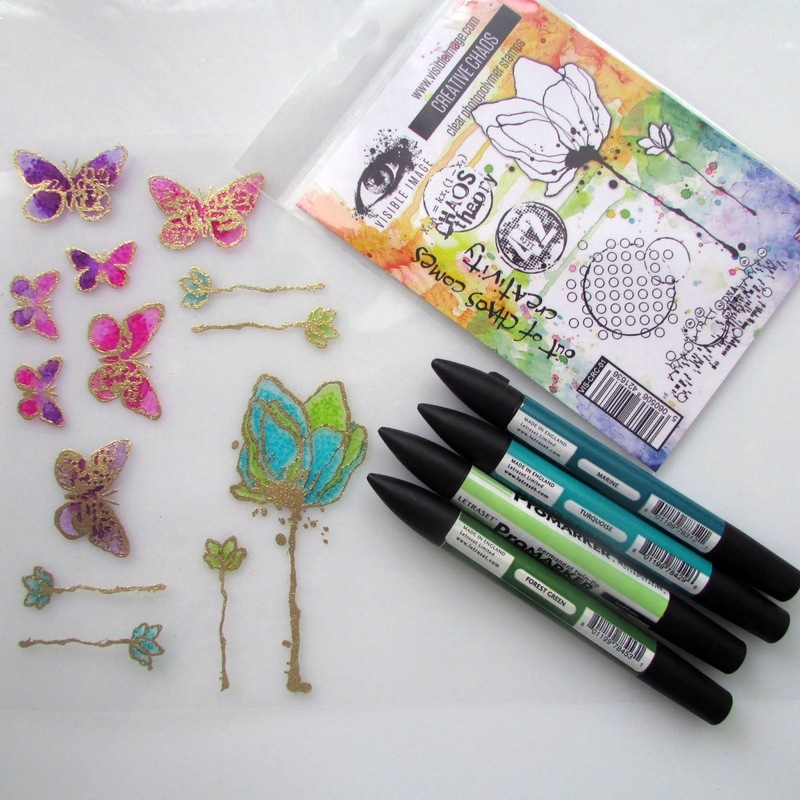 Once the butterflies and flowers were embossed, they were coloured with both copic and promarker alcohol pens. I found that if you laid down a colour and then 'dotted' on top with the same pen it gave the look of alcohol inks. Once coloured they were fussy cut. The background paper was simply stamped with distress oxide, blended over the top to mute the vibrance of the colour and left to dry. Once dry, a random pattern of butterflies was heat embossed over it. There are lots of tutorials on creating stepper cards so i won't tell you how to make them here, but the scoring measurements I used were scores at 3cm, 6cm, 10cm, 14cm and 21cm. The acetate is just an A4 sheet scored in half (it is attached to the front and back of the steps behind the patterned paper). The flowers were added on the inside behind patterned paper on the second 'step'. 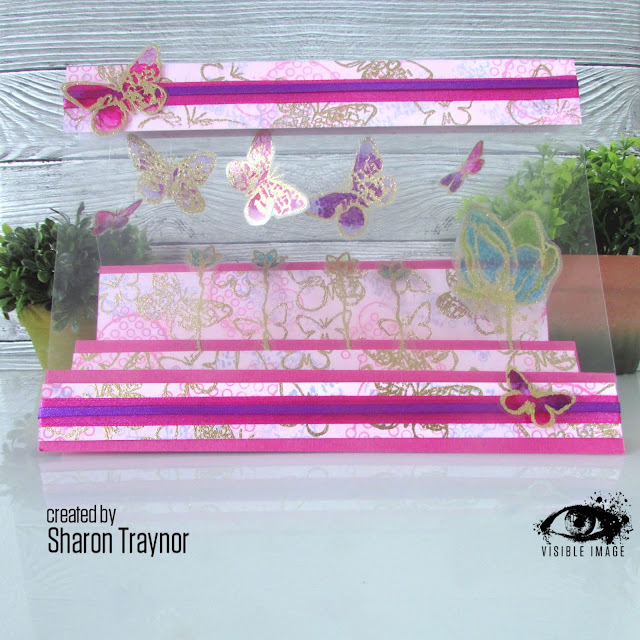 The butterflies are attached with invisible nylon thread from the top of the acetate. Then the 'tent' was added to the front and back of the stepper, as well as the patterned paper mats on the front, back and top. To turn this into a card that people can write on, you can always add a panel of white card onto the back mat. This card also conveniently folds flat for posting. Heat embossable acetate, white card, pink card, versamark clear ink, WOW! metallic gold sparkle embossing glitter, alcohol pens, distress oxide inks (shaded lilac, picked raspberry, spun sugar, nylon 'invsible' thread and needle, coordinating ribbon. A Place To Start April - Anything goes with twist of 3 or 5 (5 flowers and 5 butterflies inside the tent of this card. Dream Valley Challenge #199 - Shaped Cards no squares or rectangles ------ not sure if this qualifies so feel free to delete my entry if it doesn't. That's it from me for now. Thanks for stopping by, it was lovely to see you and I really hope you'll be back again soon. Labels: Acetate, Distress Oxides, Promarkers, Shaped Cards, Visible Image, Visible Image Stamps, Wow! I'm sharing a couple of cards that I made for the Less is More challenge today. It's a lucky dip challenge this time. 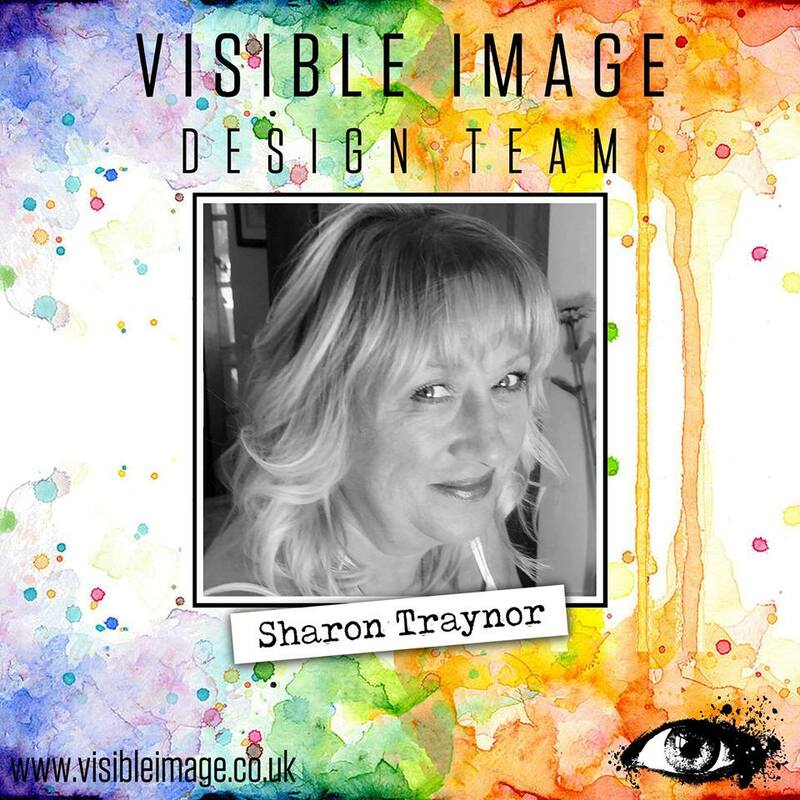 And the wonderful guest designer is one of my Visible Image team mates: Veerle from A Coloured Mind. 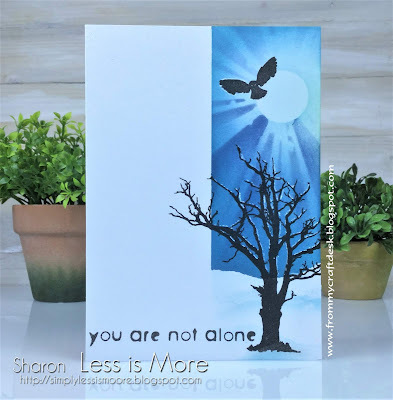 She's made a beautiful card so please hop over to her blog to check it out. The LIM DT have made some superb cards too and you can see those if you head on over to the challenge blog. Mask off one half of the card, then mask off some ground at the bottom. Make a moon mask and then blend around it with tumbled glass, Blend broken china around the outside making sure to leave some tumbled glass around the moon. Tape the stencil down so that it is centred over the moon and add some stormy sky and faded jeans over the mask trying as much a possible to focus the ink towards one side of the light rays. Remove the mask and go over the moon with tumbled glass. Make a few hillocks on the ground with tumbled glass and torn paper. Then stamp the tree, owl and sentiment in Versafine black ink. Finish the card off with some white pen around the branches to imitate the light reflecting off them. OTHER: Posca white pen, post it note, Hunkydory ink me card. This second card works for any theatre buffs or aspiring actors because it shines the theatrical spotlights. I thought it would be fun to turn this into a shaker card. It's super simple to make too. 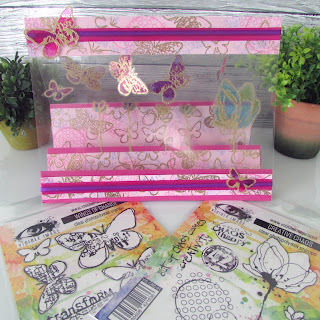 Blend a rectangular panel with the distress oxides and once the ink is dry stamp the rays of light images onto the panel with versamark and heat emboss with Midas Touch embossing powder. 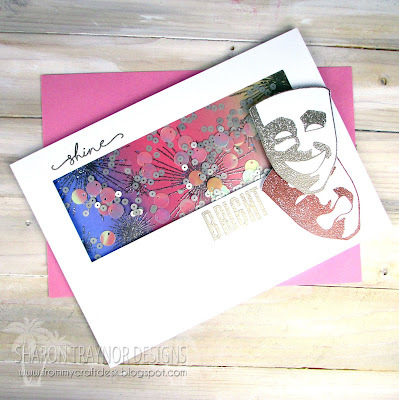 Attach the panel to a card blank. 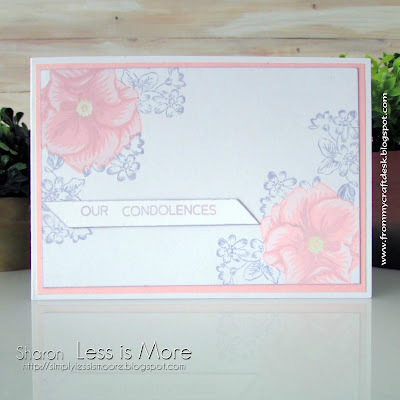 Create a card front with a rectangle cut out for the shaker element and stamp the sentiment into place, embossing it with the platinum embossing powder. Add acetate behind the cut out rectangle. 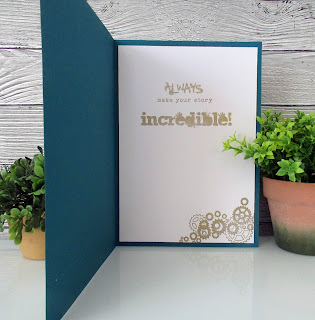 Cut fun foam to fit behind the card front and attach the foam to the card blank. Fill the aperture with small silver sequins and larger iridescent sequins. Attach the card front over the top. Stamp and heat emboss the two mask images, one in copper and the other in platinum embossing powder. Fussy cut them out and attach to the card front with fun foam. Labels: Distress Inks, Distress Oxides, Less is More, LIM, Shaker Card, Wow! This card has been named 'Metallic Fish'. Ha Ha! That sounds like a good name for a rock band doesn't it? 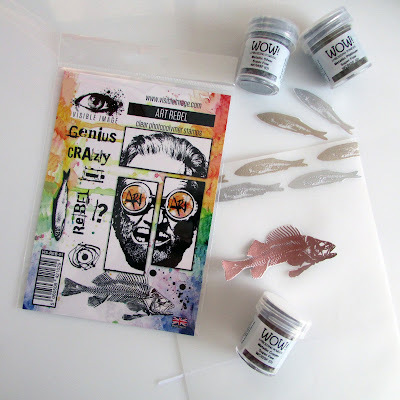 I know I like my rock music but, it is actually a reference to the embossing powders used to emboss the fish from the amazing Art Rebel stamp set by Visible Image. I love all the cards that my DT buddies make with that stamp set. I wish I could do grunge the way that they do but my style just isn't like that. 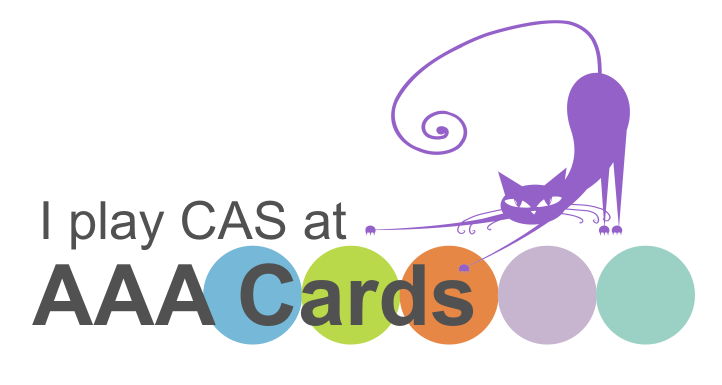 Bright colours, clean lines, CAS, pretty, easy to make ....those are the things that I do. So, true to form I wanted to make something a little bright and cheerful with these funky little guys. And of course, it had to be super-simple to make, because that's how I like to do things. I think this card would be great for the men and the boys too! To make the inky, messy background blend distress oxides over a panel, then go over the panel with tumbled glass distress oxide through the fibres stencil . If your panel is larger than the stencil (as this one was) you can ink up one half of the panel then flip the stencil so that the middle edge stays in the same place, that way it will line up perfectly. Stamp the bubbles in second generation ink in blueprint sketch and lucky clover. That is the panel finished so attach it to a card blank. Create a wavy panel (the shape was lightly drawn in pencil before I cut it out) and heat emboss the sentiment in platinum embossing powder. 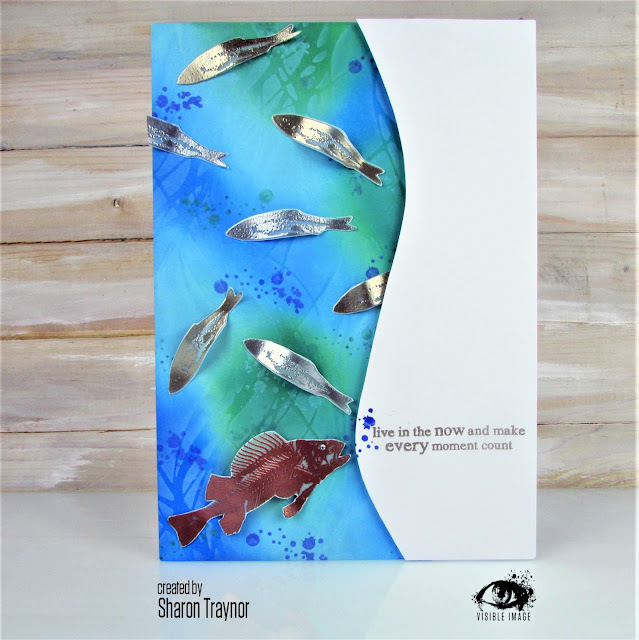 Add some bubbles so that it looks like the big fish is saying the sentiment then attach the panel to your card with fun foam. 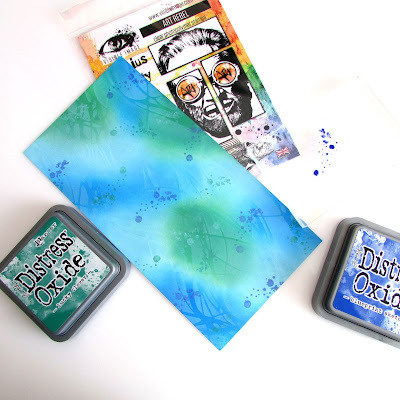 Distress Oxide Inks (tumbled glass, salty ocean, lucky clover, blueprint sketch),Versamark embossing ink, WOW! 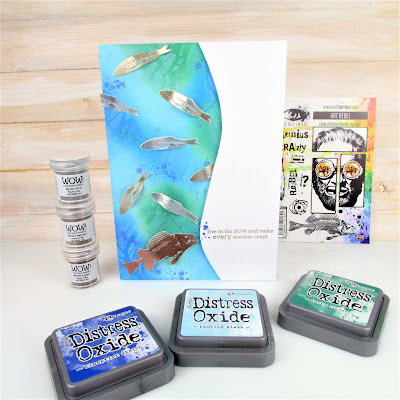 embossing powders (metallic silver, metallic platinum, metallic copper), clear gem, white card, fun foam. That's it from me for today. Thanks so much for stopping by and do come and visit again soon. 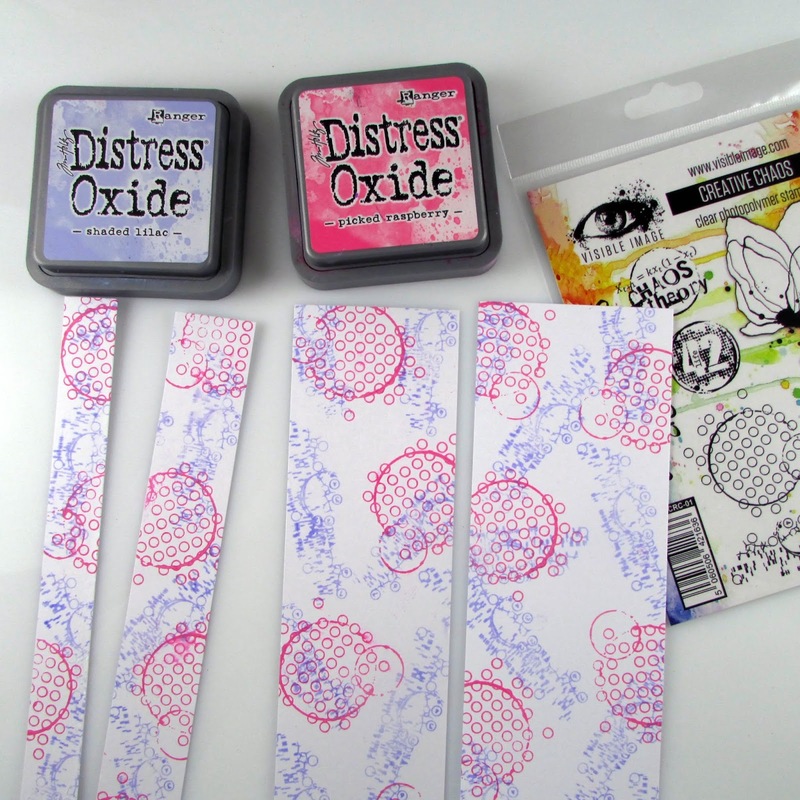 Labels: Distress Oxides, Visible Image, Visible Image Stamps, Visible Image Stencils, Wow! I knew the stamps that I wanted to use (the fabulous Random Art Of Kindness) and it made sense to use a flower and one of the sentiments. The flowers in this set are perfect for adding texture too. So whilst searching through my stash for some textural elements I came across a jar of clear glass micro beads that I've had for ages and decided to use those too. This was such a simple card to make. The card blank was masked so that I had a band to work on and a rainbow of distress inks was blended into that band. Then the flowers were stamped 'off the edge' of the band. The masking was removed and the word was repeat stamped under the band (making sure to start in the centre and work outwards towards the sides). A white pen was used to fill in the tiny circles around the flower centres, then a clear drying glue was added to the 'petals' and they were covered with the clear glass micro beads. I love how the beads take on the shades of the underlying colours. Finally glossy accents was added to the centre of the flowers and everything set aside to dry. Thanks for stopping by. I hope you like my card and I really hope to see you again soon. I've been mega busy since I got back from the UK and I currently have a house full of guests, so I'll be brief with my post today. 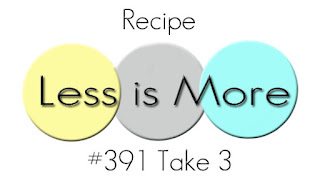 So that could be 3 of anything really! e.g. 3 words, 3 images, 3 colours etc. etc. etc. 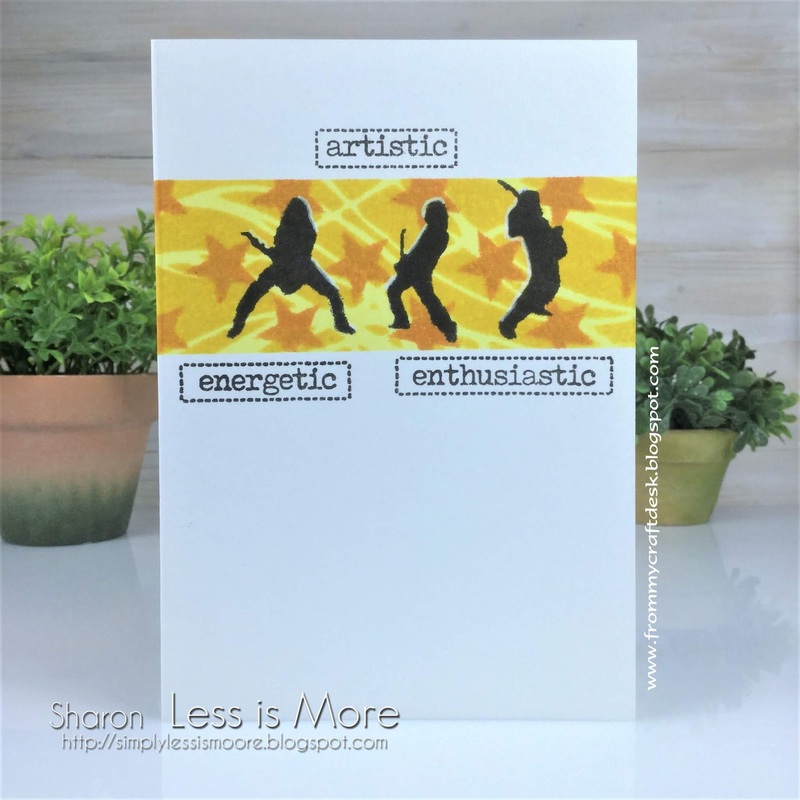 This card uses 3 stencils, it has 3 words and it has 3 silhouettes too. I've not gone overboard have I? I masked a band on the card and inked through it with squeezed lemonade, then added the fibres stencil on top and used mustard seed. Wild honey was inked through the Stars and Stripes stencil and black soot used to add 3 silhouettes from the Play guitar stencil. A bit of highlight from a white posca pen and 3 words finished this card off. 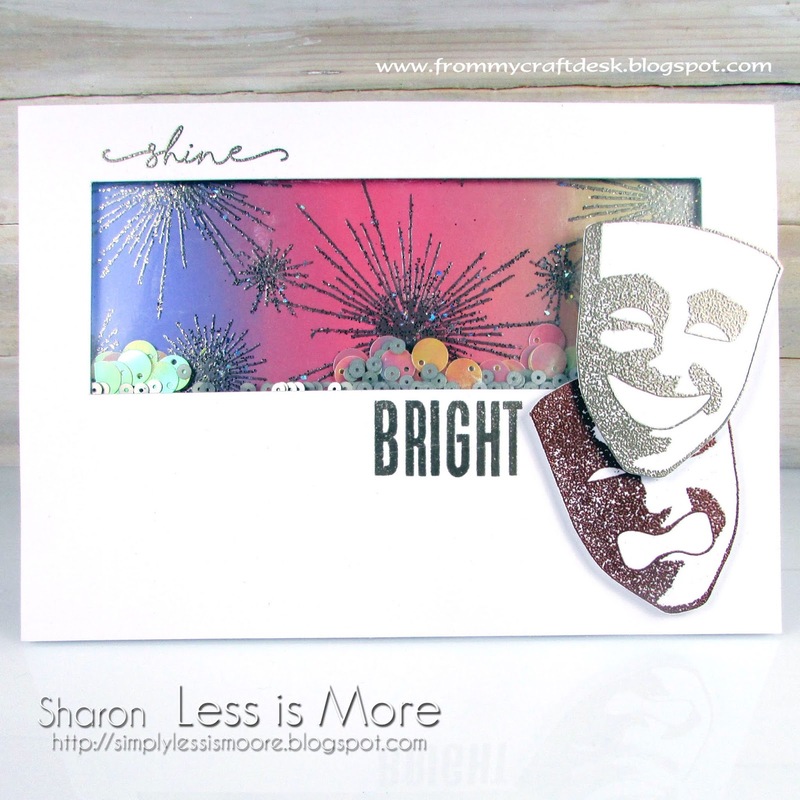 Here I've used two of the stamp sets and one stencil from the latest Visible Image release. These butterflies are so gorgeous! 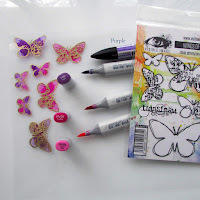 I stamped them onto water colour paper and used my zigs to colour them before fussy cutting them. The edges of the wings have been glittered with stickles for some sparkle. 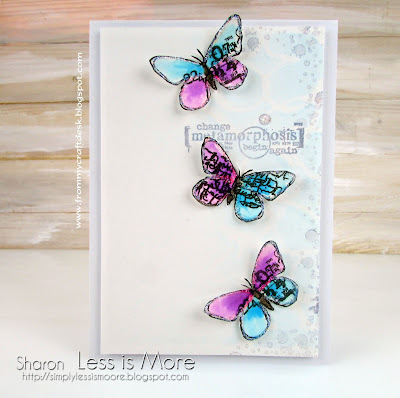 The subtle background on the panel was created by using tumbled glass distress oxide on my gelli plate and adding the Entwined Butterflies stencil over the top before pulling a partial print on one side of the panel. 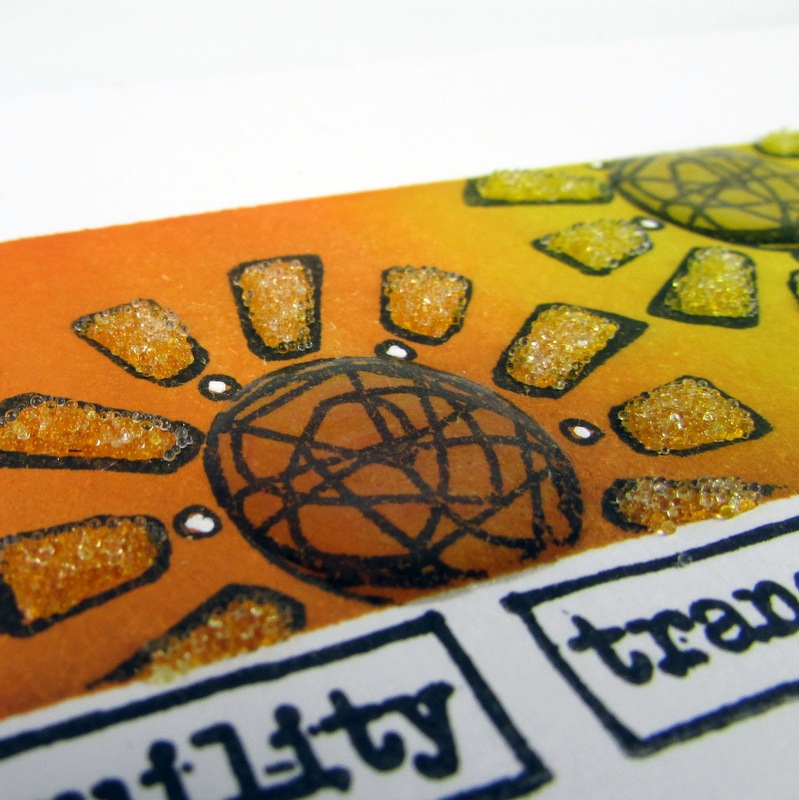 It was finished with some second generation inking of the sentiment and ink splats from the Art Rebel set. That's it from me for now. I do hope you liked these and it would be lovely to see you again soon.